In the field of speech and music signals analysis, the tonal part of a broad variety of sounds is often represented as a sum of sinusoids with slowly varying parameters. The application presented below aims at removing these sinusoids in order to extract the "noise part" of the sound. The Fourier transform remains a prominent tool for estimating the parameters of this model, due to its robustness and to the existence of fast algorithms. Its main drawback relies in its spectral resolution, bounded by the length of the analysis window. High Resolution (HR) methods are conversely not constrained by this limit, since they rely on a particular structure of the signal model. Nevertheless, they are seldom used in the field of audio signal processing, mainly because of their high computational cost. 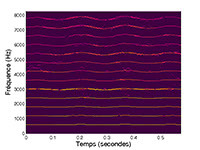 This is why we have developed adaptive algorithms for high resolution spectral analysis, which perform a fast tracking of the sinusoids variations. 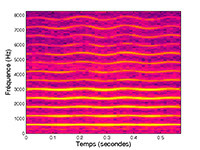 These algorithms lead to a High Resolution time-frequency representation of the signal, which we called HR-ogram, by similarity with the spectrogram. 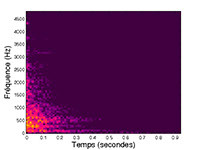 The following table presents the analysis results of two music signals: a piano tone whose pitch is constant, and a violin sound whose pitch has periodic variations (vibrato). 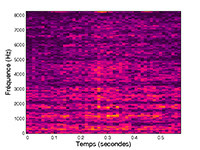 Their spectrograms are represented in the first column (you can click on the figures for a zoom). They were obtained by extracting 23 ms segments multiplied by a Hanning window. 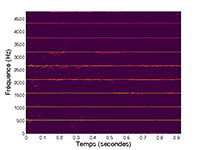 The High Resolution time-frequency representations (HR-ogram) of these signals appear in the second column. They were obtained by means of our adaptive algorithms by using windows of the same length (23 ms). In particular, it can be noticed in the violin case that the periodic frequency variations are correctly restored. The estimated parameters are then used to synthesize the sinusoidal part of the sounds by means of an overlap-add method. Residual signals are then obtained by subtracting the synthesized signal to the original sounds. 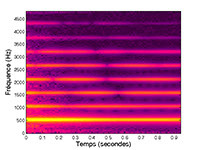 The spectrograms of these residual signals are represented in the third column. It can be noticed that the sinusoids from the original sounds were fully removed. This separation method was also applied to other musical instruments. You can listen to the results obtained in this way by clicking in the following table. By listening the noise part of these various sounds, one can distinguish some physical phenomena which are not easily perceptible in the original sounds. For example, the noise part of the piano tone clearly reveals the striking of the hammer on the string, and the noise part of the guitar reveals the pinching of the string. The noise parts of the wind instruments mainly contain breath.